The story is that a gin-drinking Dutchman and a wine-guzzling Frenchman competed in a rather laid back manner by walking about the island to claim territory for their respective nations. The Frenchman walked faster and farther, but the Dutchman was more discriminating and claimed the more valuable real estate. St. Maarten/Martin is quite small — 37 sq. miles but enjoys a reputation for excellent hotels and nightlife. The divided island holds the record as the smallest territory in the world shared by two nations. A sign reading BIENVENUE PARTIE FRANCAISE is the only way you will know you have crossed an international border. 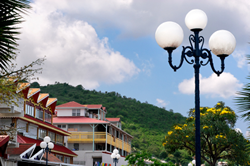 The architectural heritage of Marigot is a mix of French and Caribbean influences. The two-storied buildings of Marigot are largely built of wood and stone and painted in vibrant colors, with their characteristic sheet-metal roofs. Fabulous doors, window moldings and verandas accent the flavor of the island’s buildings. Music is everywhere in St Martin. On every street corner, in the taverns and bars, you will hear a variety of musical forms and sounds that again mixes the traditional Caribbean with the modern. The French side of the island is quieter and more sedate than its Dutch counterpart. The hotels are more secluded and you won’t be overtaken with the cruise-ship crowds. There is no mistaking St. Martin’s French heritage. The towns bear names like Colombier and Orléans, the streets are not streets but rues, and the flag of France flies in Marigot, the capital. St Martin also has some of the best dining opportunities in the Caribbean, with an many good bistros and restaurants. 35 beaches encircle the island, each different in its own way. Activities for travelers include scuba diving, wake-boarding, windsurfing, sunbathing, and, of course, relaxing. 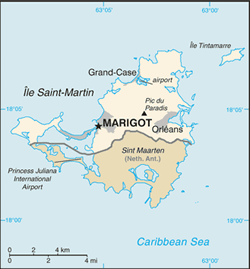 Grand Case is a small Creole village outside of Margot at the northern tip of St Martin. Lined with boutiques and restaurants, the storybook village is replete with small wooden gingerbread houses painted pastel colors. Ultra-luxurious private home on the beach in Baie Rouge. Personal chef and two pools included! From $4571 per night. Recently-renovated, stunning 5-bedroom with the best views on the island and lots of space for outdoor living! From $1071 per night.